Happiness is a multimillion-dollar industry, catering to our deep desire to live a joyful life and to a belief that, as human beings, we deserve to be happy. Gopi Kallayil believes in reversing that equation. He holds that what we truly deserve is to be human, and that the key to happiness lies in being 100 percent who we are, even if - maybe especially if - that means falling on our faces. Which Gopi has done. Many times. But he's also had spectacular success. This book explores the qualities that make us human and have helped to make Gopi successful and happy in both his personal life and his professional career. Full of candor, compassion, and Gopi's signature love of the absurd, The Happy Human spans the period from his first job as a software programmer in South China to his current position as an executive at Google in Silicon Valley. Each chapter captures an event in Gopi's life where he dug deep and found the means to express himself from a place of radical confidence: Singing live at Burning Man, even though he sings off-key. Participating in a triathlon, with an open-water swim, when he had only swum in a pool. (Lifeguards pulled him into their boat to save him.) Speaking at Toastmasters International - and being willing to be awful - before finally, years later, becoming one of their top speakers. He also weaves in accounts of others who have dreamed big and acted on their dreams. Gopi's stories and practices guide us gently toward happiness by embracing not only our own selves but the entire human experience, inspiring us to expect miracles daily, to use every fall as a chance to bounce, to live our lives full-out. "At Google it is a high compliment when you call someone 'Googley.' Gopi is one of the most Googley people I know. He says yes to life, creates new opportunities, and is as helpful and inspiring as he is effective in his work. 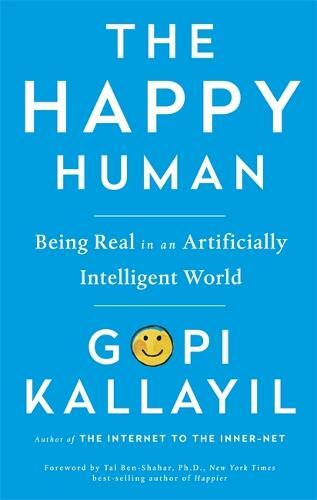 The Happy Human is a fun, interesting, and happy way to learn Gopi's insights and experience his ups and downs. A thoroughly good read." "Being with Gopi makes me happy, and now, even when he is on one of his global adventures, I can get happy reading this book. Teaching with him, I have experienced the insight, kindness, inclusivity, and humility that he brings to the book from his life experiences, which range from village life in India to tech life in Silicon Valley. I often teach a meditation that includes the phrase 'May all beings be happy.' Now Gopi gives us accessible techniques and inspiration to bring that aspiration to life. And you can start right now!" "In The Happy Human, Gopi shows us there isn't an exact formula to follow in order to achieve happiness. Instead, we must simply remember that life is one big experiment--and our only task is to embrace ourselves and the human experience. It is when we do this that we can find true meaning and live a happier, more purpose-filled life." "A good reminder of the important ways we can each change our thinking to have a happier and more meaningful life." "As a professor in Silicon Valley, I endeavor to give my students skills that will help them innovate in their careers. When Gopi visits my classroom, his effervescent stories remind students of the goal of innovation: to be happy every day, at work and at home, and to help others be happy." "Life is a series of waves, of peaks, of ups and downs. No one is happy all the time. But the only thing that really matters in life is being happy. Not just content, not just satisfied, but fulfilled and full of meaning. This is a hard goal to reach, and one that's impossible to live up to all the time. It is too easy to be living well and to not fully appreciate it. The best way to improve your life is to demand that others treat you the way you'd treat them--with compassion and respect. In The Happy Human, Gopi gives you some tips to put into practice to remain fully alive and happy." "I've been treating stressed-out, burned-out, unhealthy humans in the heart of Silicon Valley for over a decade who are constantly seeking the right diet, the right career, the right house, or some other pursuit to fill a deep longing, but inevitably fall back into old patterns. Gopi brilliantly sheds a bright light on how we can discover the path to inner peace and happiness through masterful storytelling interspersed with jewels of wisdom. As technology races forward at light speed, this is exactly the guide we all desperately need, and we need it now. I will recommend it to my patients, tech clients, and everyone in my community, since there's not a single person who cannot benefit from Gopi's book." "Having stumbled steeply, I connected profoundly with The Happy Human, especially how life's sorrows are part of the whole human experience and how these can and do ultimately lead to happiness. Gopi makes an important statement about what it means to be real. Rising from deep pain and personal tragedy, I've experienced what he eloquently describes in his book, and have felt the joy of bouncing back and sharing that joy with others. Gopi is a gifted storyteller whose delivery is a mixture of wisdom, humor, and compassion. The Happy Human is sure to inspire your heart and intellect." "Gopi artfully and articulately demonstrates why we should trust in our authentic self and not hold ourselves back because of our fear of falling, or the unknown. His sense of humor and sincerity of heart reminds us intrinsically what life can be like when we let go of our fears and discover the beauty of our potential."